I planned to make these typical South American candies for Halloween. Little did I know, I was in for a real mystery even Sherlock Holmes couldn’t solve. You see, metal cans are not transparent. I was literally cooking blind. As I learned, this is a tragic prospect when it comes to candy making. 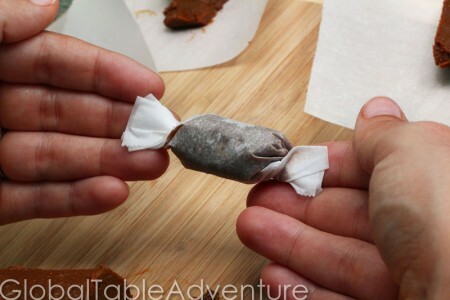 Despite my diligent efforts (nerdy, even) to make and remake these candies, I failed. I’d keep going, except I’m terrified of my next gas bill. 1. Bring water to boil. 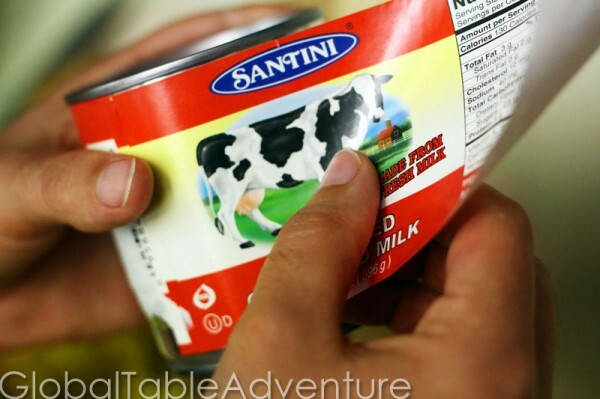 Choose a pot an inch or two taller than the can of sweetened condensed milk. Meanwhile, remove the label from the can. You’ll thank me later, when you don’t have to clean paper shreds out of your pan. 2. Make two holes in your can. This is a safety measure. Not everyone does this. I do because I’m not that into exploding cans. 3. Place can in boiling water. Cover pot and reduce to a simmer. 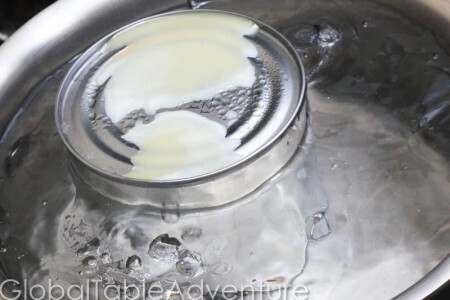 The water should be near the top, so that all the liquid in the can gets evenly cooked. Add water occasionally if too much boils off. After about six hours of constant simmering, I opened up the first can. My heart fluttered. What candy goodness would I behold? Waiting all day gave me plenty of time to work up a sweet tooth. My candy wasn’t candy at all. It was limp and smeared all over the place. It was like thick pudding. But not in a good way. I took a deep breath and decided to try again in the morning. More promising. Darker color, drier texture – cracked, even. Less limp, that’s for sure. But look how it smears! This is not candy! I thought, perhaps refrigeration will set the candy up? so I put it on small squares of parchment paper. The next day, when I unrolled the “candy,” all I had was sweet mud. Sweet mud. I suppose there’s worse things. But now what? What can I make for Halloween? I can’t feed people mud, no matter what it tastes like. 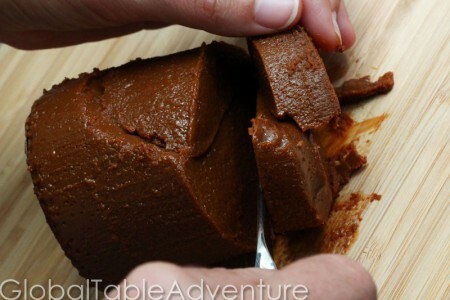 Surely someone knows how to make this recipe work … or has a good South American candy recipe? 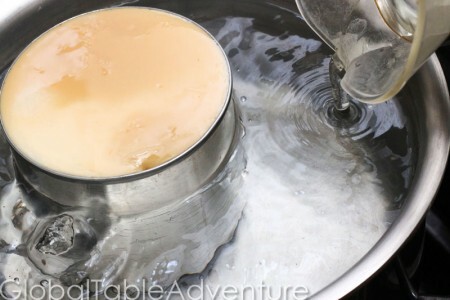 Choose a pot an inch or two taller than the can of sweetened condensed milk. 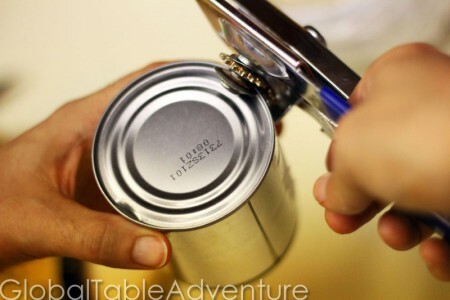 Remove the label and make two holes in the top of your can. Place can in boiling water. Cover pot and reduce to a simmer. The water should be near the top. Add water occasionally as it boils off. Remove after about 6 hours. MMmm…. what you made is what we called “grooshanka” (sp? we might not even have been saying it correctly!) when I lived in russia! 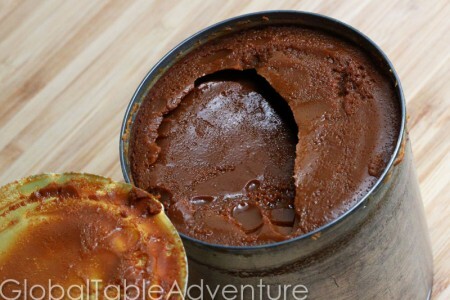 yummy yummy smearable caramel that tastes great on bread, pancakes, blini, with apples, etc. we make it almost the exact same way (simmer all day, let it cool, and open) however i’ve never seen it in the consistency you’re looking for…. i’m thinking there’s something else you need to do it it. cook it longer? add something? don’t know what to tell you! sorry! I have repeatedly failed at candy making… although using this as a spread sounds lovely. lol. I don’t know that i would cook it in a can – probably not that safe. i would be worried about what the can was adding to it. Instead, use a double boiler so you can stir it. I also don’t think condensed milk gets solid. i used to do that and called it Poor Mom’s caramel and let the kids dip apples and fruit in it at Christmas when they were small. It makes an excellent fondue too. 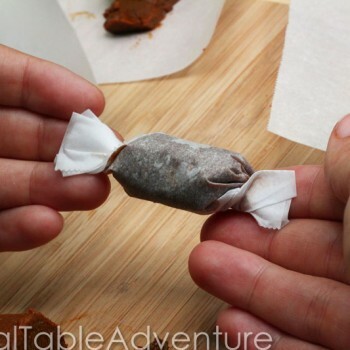 But I have never cooked it to the point of hard candy and you might have better luck in the double boiler where you can keep an eye on it better. I would say that by the time it will reach the hard hard stage it will be very dark. Maybe almost burnt looking. I was surprised how dark it was getting – and worried the same thing, that it might look too dark by the time it was done. 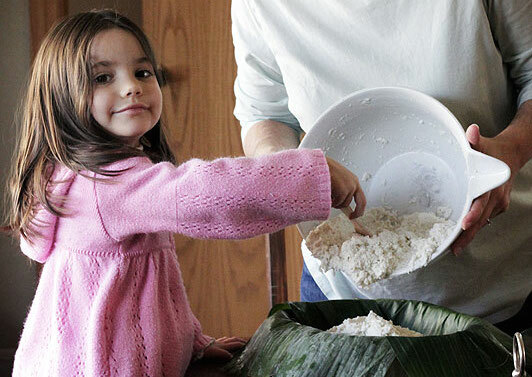 Oh, I’ve tried to make this myself, after living in Mexico briefly. I’d try Collette’s suggestion. I didn’t have a double boiler at that time, and was very short on patience. So the sugars caramelized before enough liquid had evaporated. I did get the consistency close enough to that waxy, taffy texture that I could eat it on the go with my fingers. 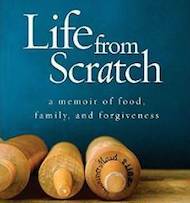 In Mexico, Mama Davila didn’t mention cooking it in the can, just in a pan. Thanks for these tips… let me know if you ever figure it out. If I do, I’ll post up. I don’t know if you’re up for trying it again, but this website had some good pointers. I think it doesn’t need to be cooked that long and needs to be mixed well while it’s hot. 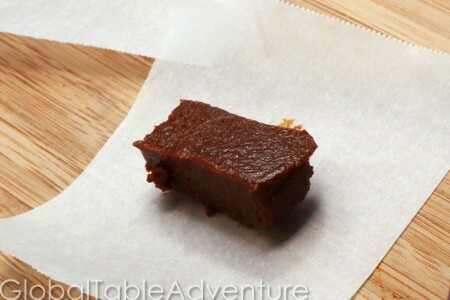 Spreading it out (while hot and pliable) on parchment, letting it cool, then cutting into candy sounds like a good idea. I like the idea of microwaving it, too. Maybe I’ll give it a go? I am 99.9% certain that this failed because you vented the can. If you keep the can completely submerged, it will not explode. You have to make sure that you check it several times during the cooking process and add water to replace what boils off. 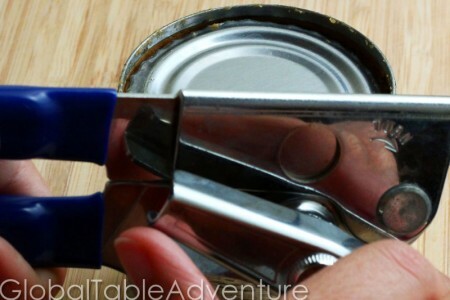 By keeping the can sealed and submerged, you have created a mini pressure cooker. The sugars will naturally caramelize and create a wonderful sauce or candy, depending on the time that you cook it. When you vent the can, you are allowing the steam to escape, which causes the sugar to burn rather than caramelize. 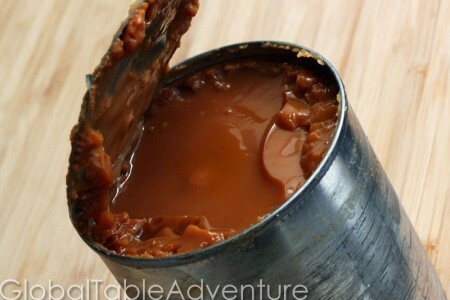 By keeping it completely submerged, the caramel cooks evenly and you won’t have different consistencies. It’s time to try it again. You won’t be disappointed!! 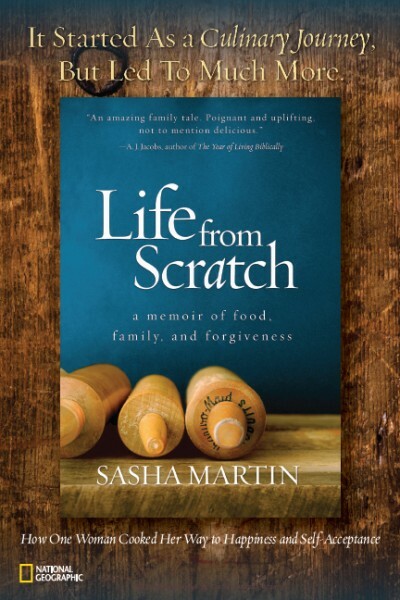 my mother did this, in the can, in the pressure cooker for an hour, let it cool, and then we used it as a carmel sauce on deserts, such as vanilla pudding, or ice cream…. but it was spoonable, not waxy for candy. Open the top of the can- off! I have cooked the milk in a can before. Actually twice. I was scared it would explode too, but It didn’t. I didn’t make candy. I made banoffi which I tasted in Ireland. The one in Ireland was delicious. Mine was good, but not as good as theirs. Basically, i think you actually had to keep it refrigerated before cutting it out. And don’t cut holes as vent. 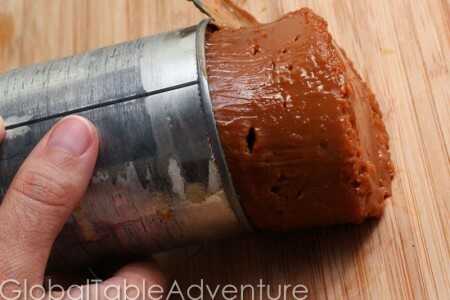 What you made actually was the traditional dulce de leche candy, but you probably tried a different type made with one can of condensed milk and 1/4cup granulated sugar. The extra sugar gives it a slightly gritty texture and helps it stay solid and keep shape.